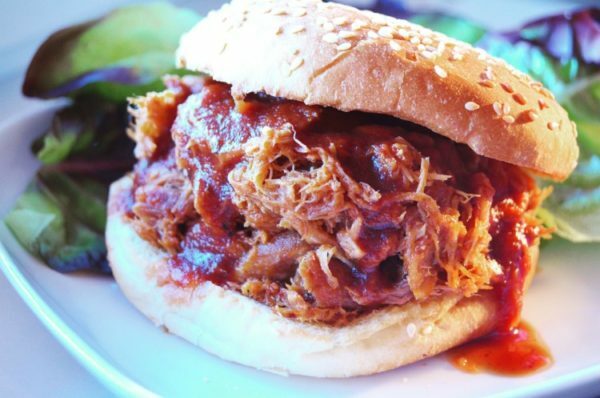 Is there anything better than a great BBQ sandwich? I may be from Texas, home of beef BBQ, but a sweet-smoky-spicy pulled pork sandwich is definitely a thing of beauty! This recipe is for South Carolina-Style Pulled Pork. Other regions of the U.S. make it slightly differently. I do not claim expertise or authenticity – I just know what I like! The BBQ sauce I use is here. It’s a slightly sweet sauce, with hints of vinegar. The sauce is made separately and then mixed with the shredded meat. Season your pork with the spice rub, being sure to rub the spices onto all parts of the meat. Place the meat in a Ziplock bag or a covered container and marinate in the fridge 8-12 hours or overnight. Place your pork shoulder in a deep heavy pot with a tight fitting lid, or in a roasting pan tightly covered in foil (if using very thin foil, double wrap it). Cook your Pork for 6-7 hours. It should shred very easily with a fork. Let cool for a while, until easy enough to handle. Shred the meat with two forks, and place into a large bowl. I hope you enjoy this Pulled Pork recipe, let me know in the comments where you are from, where you are cooking this, and how you liked it!